Description: RF&P photo, photographer and date unknown. Description: RF&P photo, photographer, and date unknown. Description: This must be the ACL /SAL bridge over the James River in Richmond, VA. Note the second train. Photographer and date unknown. Description: Photographer, location, and date unknown. RF&P photo. Description: The conductor has just grabbed his orders with his arm from tho lower loop. The engineer did the same earlier from the upper loop. The agent is on the ground ready to collect the two V-shaped arms for reuse. Description: Poor shot but only Monon BL2 in the archieves. Description: Clean Royal Blue B&OCT SW1 (1942) #8417 idles in front of a Harvey, Ill. maroon factory during spring break from College. 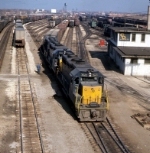 The "CT" of B&OCT stood for Chicago Terminal. Description: Note the third unit. 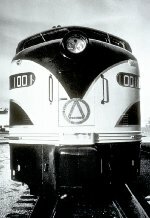 Description: This is an Alco product. Description: This was an Alco product. Description: Location unknown, date not exact. Couldn't drive, take the picture, and take notes at the same time. Description: I'm not very confident in the date. Description: What's in the red building at he lower left? Fusees? What was the name of that outdoor theater at the upper right. Description: Note the Lineman on the pole with its bottom broken off. The wreck was a derailment w/o a collision. Title: RF&P 2636 Looks Like "NEW 7665"
Description: RF&P photo, photographer, location, and date unknown. 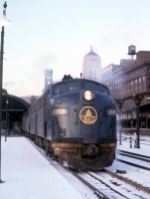 Description: Above the diesel is the station clock tower and the Board of Trade at the south edge of the Loop and at LaSalle St. Station. This shows you how far Grand Central was from the Loop. Description: Note natural gas switch heaters.